With Caracalla dead, there was only one authority that could make an emperor, the army. Chance had it that most of the troops were gathered in Syria, so it was there and nowhere else that matters would be decided. Whatever his other faults, Caracalla was no fool and had not allowed anyone with any chance of high office anywhere near the army. So this only left the two Praetorian prefects. Adventus didn’t want the job. So with no other obvious candidate Macrinus was declared emperor. It took three days before the announcement was made, so he was hardly a shoe in. In fact he had a number of serious problems in taking up such an exalted role. He was not a senator. Up until this time the fiction had always been maintained that the emperor was simply one of the Senate given extraordinary powers that were wielded on behalf of that body. This was of course pure fantasy, but if you wanted the Senate on your side it was as well to pander to their egos. And given the choice, it was generally better to have the Senate with you rather than against you. But Rome was a sophisticated state with an effective civil service. An emperor could rule without the supporting network provided by the Senate, as the likes of Domitian had shown. It was the hard way to do it though. More seriously, he was not a soldier. He simply hadn’t come to prominence by that route and not surprisingly the soldiers didn’t really see him as one of themselves in the way that they had Severus and his family. Macrinus had got where he was by his administrative talents. Good administrators don’t tend to leave interesting history behind them. The world really only works because of the men who roll their sleeves up and get on with the job. They are the kinds of people you would probably want to vote for, but who leave the pages of the history books looking very dull. Unfortunately for the empire, but fortunately for the rest of this podcast Macrinus was not going to last long as an emperor. He was well placed to be fully aware of the state of the empire. He knew the finances were a huge problem and that something needed to be done about them. The army was costing far too much to run. So he came up with a promising scheme to sort things out. The basic problem was the troops were paid too much, but that any attempt to reduce their pay would result in a revolt. The scheme Macrinus came up with was a simple one, but none the worse for that. He would keep pay and conditions the same for the soldiers currently on the payroll, but new recruits would be hired on the basis of going back to the still generous package that had worked well enough in the reign of Severus. Neat really. Left to work for a number of years the problem would have become manageable. Sensible reforms are rarely met with a great reception. You might have supposed that the troops who were keeping their high pay rates might at least be happy with the arrangement. Not a bit of it. Macrinus was unwise enough to keep the army concentrated in Syria – this wasn’t the only time he showed poor judgement in matters military, but it may have been this decision more than any other that cost him his job. What do the tough men of a Roman field army do when they are gathered in a large group with nothing much to do? Gossip of course. The mood had never been particularly pro-Macrinus. He wasn’t really trusted. So the reform of the pay structure was seen as the thin end of the wedge. What was he planning next? With the perception that their pay packets were at risk and with the story about the role of Macrinus in the death of Caracalla beginning to circulate, the mood was turning ugly. It would only need a trigger to set off a revolt. Macrinus showed a surer touch when it came to court politics. This was, after all, his background. He treated the widow of Severus with great respect – a good opportunity to appear magnamonous. But Julia Domna was not for obvious reasons, a happy woman. One of her sons had killed the other. He himself had then died a violent death after a far from glorious reign. Shortly after the death of Caracalla she killed herself. Its not hard to see why. She probably thought she had seen the worst that her family could come up with. In fact, she didn’t see the half of it. Her elder sister was called Julia Maesa, and Macrinus was prudent enough to exile her to her home town of Emesa in Syria. This is the modern city of Homs, and it is about 50 miles inland at about the same latitude as Cyprus. She was the leading light of one of the most influential and richest Syrian families. She had two daughters, both of whom were widowed and both of whom had a son. On top of her family’s wealth she had managed to acquire a large fortune by ruthlessly exploiting her closeness to the empress. She was obviously a skilled player. Macrinus had spotted the threat she posed and wisely got her out of the court. It seemed like her public life was over. But she wasn’t someone that was that easy to get rid off. Clearly a resourceful woman, she quickly perceived that Macrinus was not that secure on the throne. She hit on the idea of putting forward her eldest grandson, the 14 year old Bassianus whose mother’s name was Soaemias as a possible replacement. His claim to the throne wasn’t immediately obvious, but this was overcome by the simple expedient of claiming that he was the illegitimate son of Caracalla. To add a bit of depth to the claim he was renamed Marcus Aurelius Antoninus – a crafty bit of positioning. Antoninus was at the time consecrated as a priest in the temple of the Sun in Emesa. The temple was popular with the troops stationed there who were used to seeing the the youth in attendance in his priestly outfit. It wasn’t too difficult to plant the idea that he was related to Caracalla in their minds. They soon believed that they saw the features of Caracalla in his young face. Lavish gifts from Julia probably helped as well. Before long they had become firm followers and came out in open revolt against Macrinus. So Julia now had a small army at her disposal. Macrinus on the other hand had many legions and could easily have snuffed out this challenge before it became serious. But the small detachments sent to dispose of the apparently insignificant uprising went over to the side of Antoninus. Meanwhile the main army at Antioch was troubled by frequent mutinies and problems with pay and supplies. Macrinus didn’t really have the touch when it came to handling the army. He dithered and let rebellion get up a head of steam until it began to pose a very real threat. In the end he was obliged to march out of Antioch in strength to deal with the Antoninius. He still had the larger force and the rebels were soon hard put to. War in the ancient world was a science in the hands of skilled practitioners. The outcome of a battle would generally depend on the relative resources and positions of the opposing forces. But the battle of Antioch pitted two inexperienced and unwarlike leaders against each other. In these circumstances, the characters of the protagonists proved to be the decisive factor. When things were looking bad for the rebels Antoninus himself – young as he was – threw himself into the fray with courage. Likewise his mother and grandmother appeared on the field to encourage their side. On the other hand, the over-cautious Macrinus lost his nerve at the crucial moment and fled. With Macrinus deserting them, his soldiers threw down their arms and embraced the men they had just been fighting as brothers. Rome had a new emperor. Macrinus was captured and killed a few days later. That Antoninus should have showed so much courage in battle was not something that you would have expected. He did not want to be either a soldier or a politician. He had been quite sincere in his desire to be a priest. And religion was going to play a large part in the story of his reign. He was a follower of an easten mystery cult of the Sun, which was worshipped at Emesa in the form of a black conical stone that was believed to have fallen from the sky. The name of this Sun god was Elagabalus, and it was this name that Antoninus took for himself and by which he is remembered in history. He made it his mission to displace Jupiter from his place at the head of the pantheon with the god Elagabalus. He only slightly softened the project by using the latin name Deus Sol Invictus – the Divine Undying Sun. He had the black stone brought to Rome with some pomp. It was delivered on a chariot pulled by six white horses. Elagabalus and his ministers preceded the rock walking backwards to fully enjoy its blessings. It was set up in a splendid new temple erected on the Palatine hill for the purpose. It became a scene of the most costly and elaborate sacrifices. Rich incense was burnt while a chorus of Syrian devotees performed sensual dances. The most prestigious of the citizens of Rome were required to attend, unwillingly implicating them in the overthrow of their own tradition. Elagabalus was intent on creating a new religion for the Roman Empire by fusing his cult onto the traditional pantheon. This required the disrupting of old practices and looting the treasures of the established temples. He had the Ancilla placed in his newly built temple of the Sun. The Ancilla was an ancient artifact that was supposed to have been the belt of Numa, the famously pious king of Rome. This was claimed to have fallen from Heaven and to be sacred. The Palladium, the very soul of the city, was also moved. This ancient image of Athena had been brought to Rome from Troy by Aeaneas, the legendary founder of the city around a thousand years before. He was meddling with the most venerable of the objects in Rome. To fully integrate the new god of the Sun into the Roman’s extensive existing crowd of gods Elagabalus set up a wedding with the Moon. The go-to place for Moon worship was Carthage, where she was known as Astarte. The image of Astarte was transported across the Mediterranean to symbolise the union. This gave another chance for a massive ceremony and a public holiday. Elagabalus was obviously in his element and having a ball. His upturning of the traditional religion did not stop there. He also married a vestal virgin. This was really not what you were supposed to do. Read the label! Marrying a Vestal Virgin would have been quite enough on its own to shock a pious Roman to his core. The prescribed punishment for a Vestal Virgin who failed to keep her vows was being buried alive. They took this sort of thing very seriously. But there was more. He also married his charioteer Hierocles whom he described as his husband and who he publicly announced as having the authority of the emperor. And this was still not all. He had many lovers of both sexes and to some of them he gave out the prestigious posts that the more regular citizens might have expected to receive. Homosexuality wasn’t viewed as an absolute outrage in the way the Victorians did. But it wasn’t freely accepted as simply the way someone is as we do nowadays either. It was perfectly acceptable for an emperor to have male lovers. But it wasn’t okay for them to take the passive role. Caesar was widely mocked for a story that he had once done so with an Eastern potentate. Elegabalus made no secret of his inclinations. He even dressed in women’s clothes. It is hard to think of a taboo he had left unbroken. Elagabalus was the first emperor of Asian origin. For Gibbon, being Asiatic was synonymous with effeminacy and decadence. In Gibbon’s time the whole of the middle east was occupied by the Ottoman Empire, a despotic power with a mysterious Sultan hidden from public view with his harem and eunuchs in a secret area called the Seraglio. So there was a sort of justification for Gibbon’s prejudice. The Romans would probably not have seen things this way. The ascribing of virtues and vices to geographical areas would have seemed as strange to them as it does to us. But they certainly didn’t like Elagabalus. His behaviour must have been profoundly shocking, particularly his undermining of the centuries old religious foundations of the state. His new rites must have seemed a bit like having Alice Cooper taking over a cathedral. Indeed with his outrageous appearance he must have looked a bit like something out of a heavy metal video. Discontent with the dangerous young foreign weirdo grew and grew rapidly. Julia Maesa was still behind the scenes and trying to pull the strings, bit Elagabalus was uncontrollable. But she was nothing if not shrewd, and realised that as Elagabalus was rapidly losing the respect of the Romans she needed to do something. Luckily she had a back-up. She got Elagabalus to promote her other grandson, Alexander, craftily renamed Alexander Severus, to the role of co-emperor. As you would expect, this didn’t work very well. Wielding sole power is very much the whole point of being an emperor. Elagabalus was soon trying to get rid of Alexander. His ineffectual attempts to do so had the effect of giving the anti-Elagabalus feelings a solid grievance to coalesce around. Alexander was to be the undoing of Elagabalus. He issued a decree demoting his cousin. This was the trigger for open rebellion. The Praetorians refused to obey his instructions. In fact they put themselves forward as the protectors of Alexander. They promised to use their power to make sure his rights were respected. The direct approach having failed Elagabalus tried being devious. He gave out completely false information that Alexander had died. It is far from clear what he hoped to achieve by this. What he actually did achieve became clear very quickly. The troops suspected that Alexander had been murdered and stormed the palace to take their revenge. 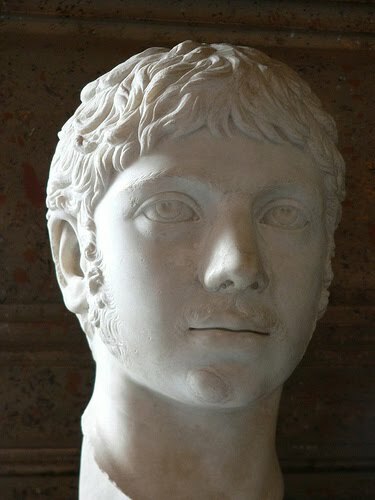 Elagabalus was killed along with his mother. His mutilated body was dragged through the streets amid jeering crowds and thrown into the Tiber. I am not sure Gibbon has it entirely right here. Posterity has tended to ignore rather than condemn Elagabalus. I think it is because he is basically a one off, a sort of interlude in the run of history. His religious reforms were not part of any pattern. In fact they seem to have been spontaneous ideas that he just made up as he went along. They didn’t have any particular long term effect. I often think of Elagabalus when I see odd looking teenagers hanging around in shopping centres. You dread what sort of party they might throw while their parents are away. Think what would happen if they were left in charge of the world for a few years. That is pretty much what the reign of Elagabalus was like. To his credit – Elagabalus was not bloodthirsty, just homosexual in a receptive form. He was inept but a lot better than what came before and after Alexander. Also Severus was Punic thus the term Hannibal's revenge or the Punic Sulla. I don't have the reference to hand, but I think the Historia Augusta had it that Alexander refused the title of Antoninus because he didn't feel worth of it. Mind you, the Historia Augusta is probably not the definitive last word on the matter.